This year marked the start of the 38th Super Sentai Season in Japan, called Ressha Sentai ToQger. For those unfamiliar, Super Sentai is a brand of tokusatsu (Japanese live action drama with special effects) by Toei Company, and known in America as the source material for what we call “Power Rangers.” Before I jump into ToQger, I feel it only fair to mention that this is my first time following a Super Sentai show while it is still currently airing, and prior to this my only exposure to the genre is watching Super Sentai season 35, Kaizoku Sentai Gokaiger, along with many seasons of Power Rangers and various video clips online. With that in mind, I will be purely evaluating this series on its own merits and not how it compares to its predecessors. The story starts off with Bag Shadow, a minion of the Shadow Line, abducting children with imagination and taking them aboard one of the evil Kuliner trains. Unknown to the monster, there is a man aboard the train fast asleep, and snoring! After he wakes up, we discover his name is Right, but before we can find out more the Kuliner is intercepted by the Ressha trains riding the Rainbow line, which carry the ToQgers (Or, at least, rangers 2, 3, 4, and 5. Ranger 1 is not revealed yet). 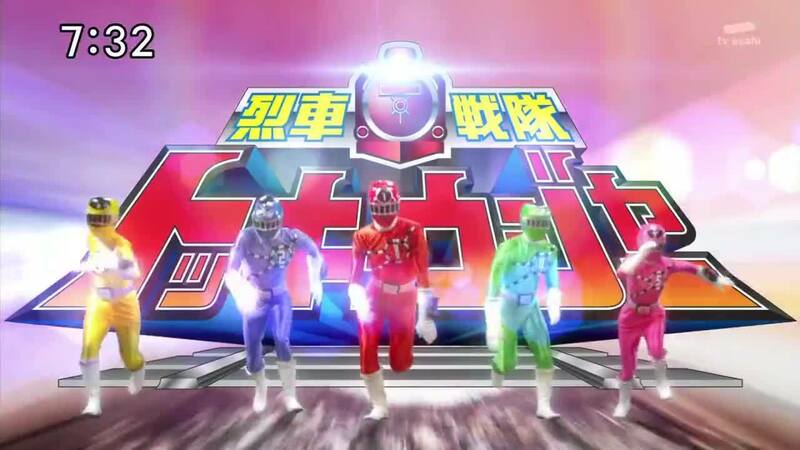 The ToQgers disembark to fight the monster and his Kuros (grunt monsters). During battle, Right tries to help the ToQgers but is knocked out, and the ToQgers take him back to the Ressha. Right awakens to discover that the ToQgers are none other then his childhood friends, and that he is actually the 5th ToQger. While Right reacquaints himself with his friends, the Ressha train catches up to the Bag Shadow’s train and stops it in its tracks, giving them another chance to rescue the kidnapped children. Right and his friends all “henshin” (transform) ToQgers as a complete team for the first time and proceed to fight the enemy once more. In the process, they pick up the ability to trade suit colors and respective powers and also learn how to summon and form ToQ-Oh, their giant train mech. Using ToQ-Oh, they are able to defeat Bag Shadow and rescue the kids. Back on the train, ToQger meets with their mentors, Conductor and Ticket, and learn some disturbing news which I won’t spoil; you just need to watch and see for yourself. As far as first episodes go this one was pretty decent, but there were definitely a few things that could have been done better. First of all, the suits were not that great; I wish the helmets didn’t have the train rails on the visor. Just changing that would have helped a great deal. Secondly, I really wish the imagination motif described throughout the episode was used more. One case involved Ranger 5 (primarily the pink ranger) being frightened during battles or feeling inadequate and using her imagination to imagine herself stronger, using that image to defeat the enemy in reality. The other was imagining the final attack before the mechs are called where the enemy is buried in crying baby dolls, as a punishment for making the kids cry. I’m hoping this is touched on more in the coming episodes as this has some great potential. Finally, as it stands now, the characters leave much to be desired. Most are the standard stereotypical roles in a team; the smart guy, the generic girly girl, the quiet one, the badass girl, and the reckless optimistic leader (this one is particularly reminiscent to me of Masaru from Digimon Savers). The villains look interesting, though, and I am excited to see how they develop. Despite these faults, I’m enjoying Ressha Sentai ToQger. The fight scenes are really awesome, despite being a bit confusing when everyone is color swapping every two seconds. The opening song was, in my opinion, better than some of the others in recent years, and the background music was well-composed. All in all, I would recommend giving this a look if you’re interested in Super Sentai or Power Rangers. I see some good potential in this series, and I’m hoping as it develops some of my concerns are laid to rest.